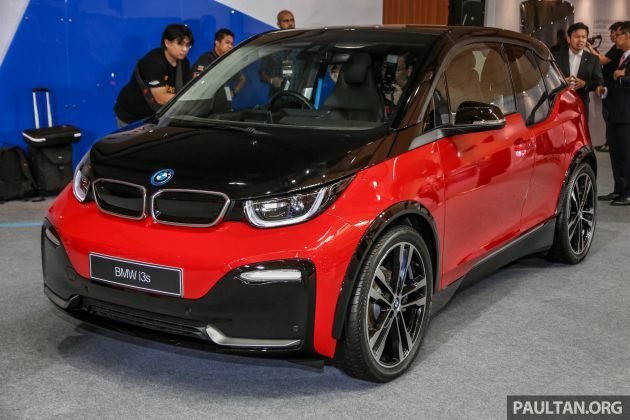 BMW Malaysia today launched the BMW i3s at the 2019 Malaysia Autoshow, making it the first premium car brand to introduce an all-electric vehicle in our country. The i3s is essentially a sportier version of the i3, and was first revealed when the model received its first full facelift back in August 2017. 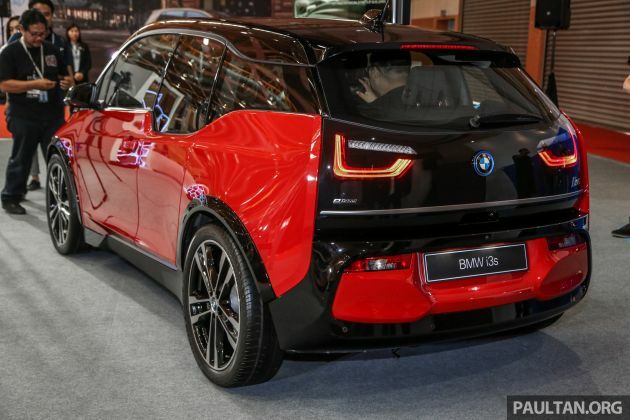 Motivation for the i3s is provided by a rear-mounted synchronous electric motor, which is packaged together with integrated power electronics, a charging unit, as well as generator function for energy recuperation via braking (up to 50 kW). The e-motor provides 181 hp (135 kW) and 270 Nm of torque, which is good for a zero to 100 km/h time of 6.9 seconds, and a top speed of 160 km/h. A modified motor control and new taper roller bearings are improvements over a regular i3, and result in a different power delivery strategy. For further distinguishment, the i3s also comes with a dedicated drive mode ‘Sport’ that can be selected in the Driving Experience Control system. Parked under said mode is a Traction programme that allows for small drifts when grip levels are low. To power the e-motor, the i3s comes with a lithium-ion battery located in the vehicle floor for a lower centre of gravity. The battery is rated at 42.2 kWh (output) and 120 Ah (capacity), with a more realistic customer oriented electric range of 260 km in everyday use, or up to 345 km if you prefer the WLTP test cycle. This battery capacity/output is the latest and largest to be introduced to the i3 range, as part of a minor update revealed in October 2018. Recharging the battery can be done either via AC or DC charging, the former utilising an 11-kW onboard AC charger and a Type 2 connection. For DC charging of up to 50 kW, you’ll need to use the Combined Charging System connector, which is an extension of the Type 2 connector with two additional pins below. With a BMW i Wallbox Plus that delivers 11 kW of three-phase, AC charging power, it’s possible to charge the battery from zero to 80% (about 180 km of range) in about 3.1 hours. However, you’ll need to fork out RM8,897 for an i Wallbox Plus to be installed in your home. An additional RM1,360 is needed for a public AC quick charging cable, which is separate from the one that comes with the car, which plugs into a wall socket. Should you need to charge when away from home, the i3s, like other BMW iPerformance models in the country, can utilise the ChargEV network of chargers in the country as part of the BMW ChargeNow service, offered as part of the BMW 360° Electric programme. Depending on the location, ChargEV chargers have outputs of 3.7 kW, 7.0 kW, or 22 kW. Beyond the drivetrain, the i3s also comes with specially developed springs, dampers and anti-roll bars, along with a 10 mm lower ride height for sportier driving dynamics. Other driving-related features include optimised Dynamic Stability Control and Dynamic Traction Control systems, as well as Cornering Brake Control and Dynamic Brake Control. The exterior of the i3s is identified by more aggressive front and rear bumpers, which are complemented by gloss black accents on the front apron and grille, as well as gloss black fender extensions that mask a 40 mm wider track. As standard, the EV comes with full LED headlamps and 20-inch BMW i light alloy five-double-spoke (Style 431) wheels with staggered tyre sizes (175/55 front and 195/50 rear). 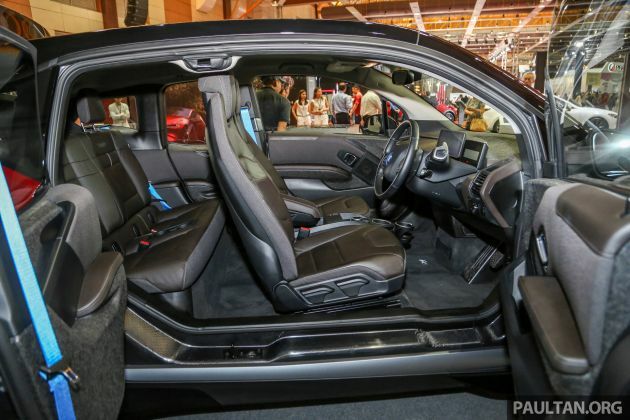 Moving inside, the i3s is specified with the BMW i Interior Design Suite, and features Dark Truffle Vernasca leather upholstery along with a Carum Spice Grey headliner. The use of sustainable materials is also common here, with recycled plastics, natural fibres and unbleached eucalyptus wood being used for various parts of the interior. The cabin also comes with two screens, with the first being a 5.7-inch TFT-LCD unit serving as a digital instrument display. 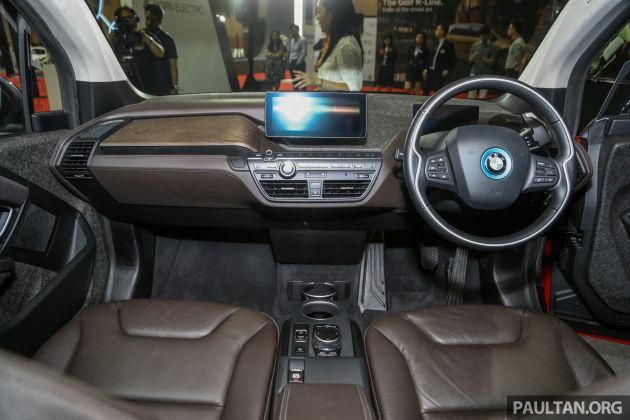 The other is a 10.25-inch unit on the dashboard, which is linked to a BMW Navigation System Professional infotainment system and iDrive operating system. Safety-wise, the i3s comes well equipped with the Driving Assistant Plus package that consists of a rear-view camera, Park Distance Control (front and rear), active cruise control with Stop & Go function, Collision and Pedestrian Warning with City Braking function, plus Traffic Jam Assistant. Owners will also have access to BMW ConnectedDrive and its attached services, including Intelligent Emergency Call, Concierge Services and Remote Services. The BMW i3s carries an estimated retail price of RM279,000 (OTR without insurance), and it is available with Balloon Financing Plan from BMW Group Financial Services Malaysia. Based on an 80% loan uptake on a five-year tenure, the i3s can be had with monthly instalment plans starting from RM3,188. Colour options include non-metallic shades – Fluid Black and Capparis White – as well as the metallic shade Mineral Grey, all with BMW i Blue highlights. Included with each purchase is a five-year/unlimited mileage warranty with free scheduled service, a two-year tyre warranty programme, along with access to BMW Roadside Assistance and Accident Hotline, the BMW Group Loyalty+ Mobile App – BMW White Card and BMW Service Online. The battery in the i3s comes with an eight-year/100,000 km warranty, and is made up of eight modules. It’s very unlikely that an owner will have to replace all the modules in the lifetime ownership of the vehicle, but the vehicle will inform the owner should a replacement be necessary. The cost of one module is RM7,300, with labour costing RM1,140 – the latter would likely be lower due to the factory warranty that comes with the car. We’ve already had a go in the BMW i3s, and if you’d like to find out more about it, you can check out our review of the sporty, all-electric model here. For detailed specification of the i3s, head on over to CarBase.my. And the worse part, after it became a big scandal and went viral, the price of the battery can drop from RM130k to RM55k overnight. If you’re so fedup, then don’t go around demanding for locally made EV cars. It won’t be cheap either way. Go and read the article la, each module 7300, total 8 module if u really so unlucky all spoilt..
Before purchase do due diligence. This is the normal reaction from a normal person. You can partly blame the government for not pushing the EV agenda. Take a look at how Norway is embracing the technology. Massive rebates when buying any EV. It’s even one of Tesla’s biggest single country market. Use Uber and high chance you will get to ride one. If they can do it, why can’t we? Once again, it’s partly the government’s fault. topdog sounded like an unwanted stray. topdog seemed to suffer from poor upbringing. why not try paws to get adopted into a nice family? any takers? no? seems like your comments came out from the wrong end of a topdog. poor topdog. no takers too. can someone throw topdog a bone here? Waiting for the local pictures of the said EV. Did this model received the government rebate? 20% downpayment and still need to serve RM3k a month for the next 5 years..
i rather spend RM50k (less than 20% of i3s) to purchase a Bezza LE and pump accelerate like no body business, still dont require tp spend RM3k a month for petrol. It’s a techy looking car. An acquired taste. But I think it looks nice enough. Specs looks good. Yeah, it is expensive and wonder if those thin low profile tyres are easy to find here. But you will look different from everyone else. And it is RWD, cos BMW has their priority right. But the range means this is strictly an urban car. Cars like these with new leading edge tech will be for the well-to-do for the novelty ‘I have it first’ factor…. Not made to market to the masses lah… So stop saying I rather go for ‘this and that’. Let’s just wait and see how many can be seen on the road in 3 months’ time.